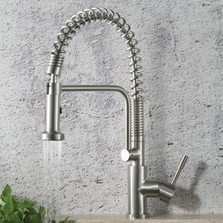 Isenberg brings you kitchen and bathroom faucets with a balanced combination of aesthetics, service and price. They uses the finest components, never compromising on quality. Faucets are independently tested and certified for mechanical durability by IAPMO and carry the Universal Plumbing Code Logo. Isenberg's dedication to superior quality is reflected in the fact that their manufacturing from brass to plated fixtures occurs in ISO Certified & IAPMO audited foundries. We have to minimize the impact on the environment while maximizing water delivery. This is the main reason why there are no uber-high-flow fixtures in the Isenberg product range, simply because it is wasteful. The technology that goes into their products helps them deliver bath systems that do not exclusively rely on the volume of water that is available. Their idea is to create faucets that enhance your water experience by using technologies that allow greater body to every drop. 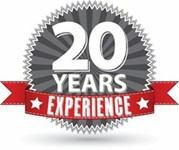 Your faucets come to you directly from Isenberg Faucets with a full manufacturer warranty. We pass these factory direct savings on to you. Plus our knowledgeable team is here to answer all of your questions. Designers and consumers alike love Isenberg because the variety and depth of their collections make it easy to create a cohesive finished look that complements any décor. Isenberg products make a style statement that speaks of luxury, elegance and simplicity. And because of their uncompromising quality, Isenberg products make long-lasting additions to your bathroom that will retain their beauty and function for years to come. With their singular investment in technology and devotion to craftsmanship, Isenberg offer's an amazing array of design possibilities. 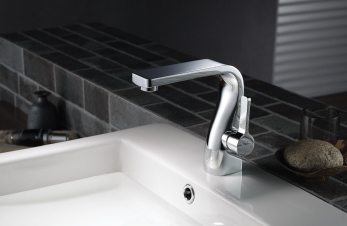 Their collections of bathroom faucets, basin mixers, shower-heads and other systems and fixtures may vary in style, but all share common attributes such as solid brass construction, precision machining, and meticulous finishing. 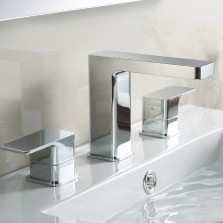 Isenberg three hole, four hole and wall mount faucets used solid brass machined valves made in Germany featuring quarter turn ceramic cartridges. With a fully automated polishing process Isenberg products have a perfect mirror finish. Isenberg provides a full range of high quality, fully coordinated decorative bath plumbing fixtures. 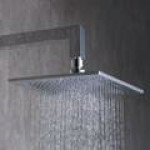 They offer faucets, shower heads, an extensive range of shower valves [thermostatic and pressure balance] and much more. They work with the best around the world, using expertise from various artisans and technicians, to create impeccable quality at rational prices. Their prices are a fraction of other European designer brand prices because of their multi-locational global manufacturing partnerships. And once you get an Isenberg faucet home, it will stay with you a long time.